This ebook is also available as a softcover! Click here for links to all my print books. Intentional Quiet Time Journal (for boys): 6-Month Bible Study Journal provides a fun way to spend time in God's word each day. 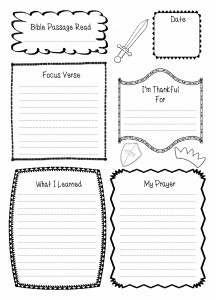 Each day includes a place to write the date, the Bible passage read, a focus verse, several things to be thankful for, what was learned, and a prayer. Another fun feature is the ability to color in the graphics.